Bali has always been known for its cultural diversity. Yet even with so much diversity, there is a single common thread running through the soul of the island. That is food! In addition to its culture, food represents all that makes Bali distinctively different, and provides a window into the island’s past, present and probably even future; knowing the island cuisine allows one a rare and untainted glimpse into Bali’s heart and soul. For some of you, the very best of Balinese cuisine might be rigorously authentic—right down to some ‘scary’ meats. Well, that’s not entirely true, for there are many Balinese dishes that are very well-processed and presented. As you probably know, rice is the basic food for most Asian nations. However, it is more than just staple food for Balinese – it is the basis of life itself. Endowed with such fertile and arable lands, the Balinese also practice their creativity with the rice and offerings to show their gratitude. Therefore, in treating rice as the basis of life, the Balinese hold certain rituals from planting to harvesting. The rituals of planting, maintaining, irrigating and harvesting rice certainly enrich the cultural life of Bali. At the beginning of planting time, after the water buffalo walk the rice fields several times, ceremonies are held to carry the young stems of rice that have been nurtured in a special nursery. On each section of the rice fields, the corner nearest to Mount Agung will receive the honour to be the first place to receive the young stems. The planning and responsibility of the irrigation and planting schedule are arranged through subak, a Balinese system that ties together rice cultivation with its water temple system. Throughout growing time and at harvesting, ceremonies are also held and offerings are presented to Dewi Sri, the goddess of rice and abundance. This is why in the middle of the rice fields you often find little shrines with neatly decorated flowers, fruits and offerings. The belief that the gods and goddesses appreciate the mundane pleasures as much as the mortals is an important aspect of religious life in Bali. Treating the cyclical process of planting and harvesting rice with so much respect is also believed to please the gods; which in effect, would also please the humans with an abundance of crops. Now, Balinese society is very community oriented, especially since many rituals and ceremonies require a massive effort. A person must be actively involved in village meetings, play an instrument in the orchestra (gamelan) or dance in ceremonies. If a child in a family is having his tooth filed, the rest of the village’s women will help cook and prepare, and the men help erect a stage and decorate the house. 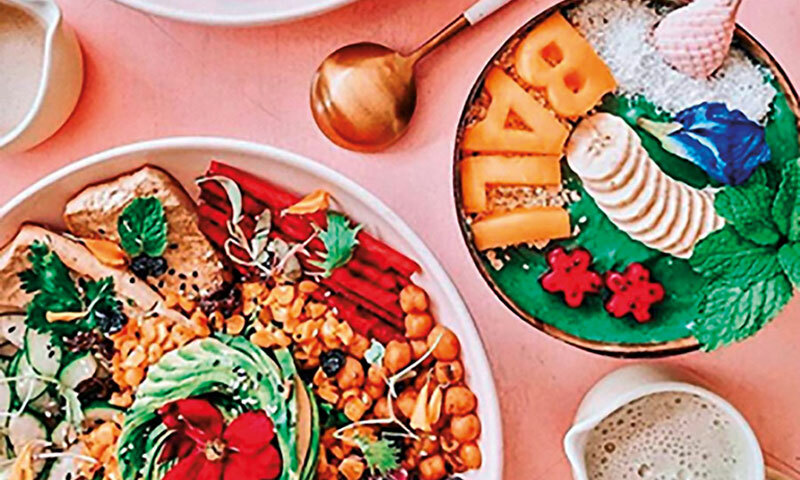 And when it comes to community gatherings, food once again takes centre stage in Bali. Traditionally made for family and community gatherings, meetings, and functions, the Balinese Megibung is a delectable feast served on one big banana leaf. People will then circle around the food and eat with their bare hands as a symbol of togetherness. In Megibung, the chair-less seating arrangements are made from the north-end of the table or on the floor, starting with the oldest member and ending with the youngest member at the other end of the long table, with each member of the gathering wearing traditional Balinese clothing – all sitting cross-legged. The word Megibung derives from the Balinese word gibung, which means “share with each other”. 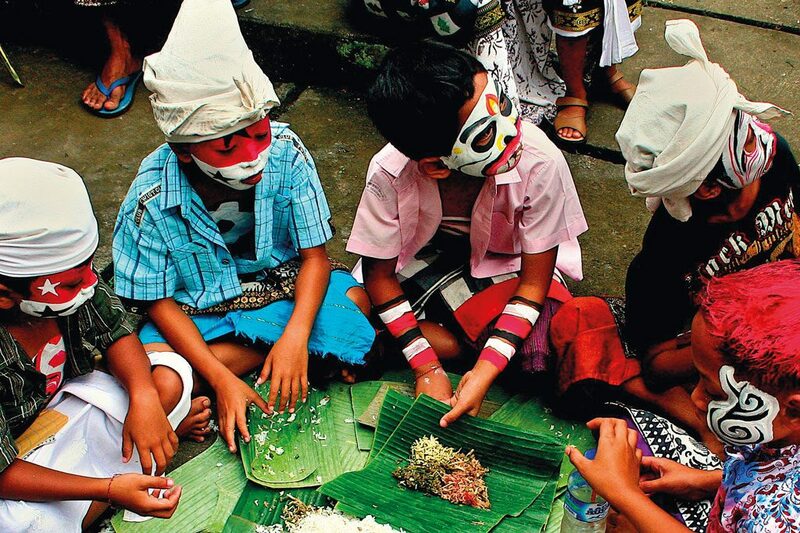 It is said that this feast was pioneered by King Anglurah Karangasem of Karangasem Kingdom. On his journey to expand his region, the king and his soldiers went into several wars. After winning the war, the king and his troops found a place to unwind and had a celebratory feast, where he commanded that all of them would eat together from one huge leaf. During the feast, the King enjoyed togetherness with his troops so much, it tore down the social differences between them all. 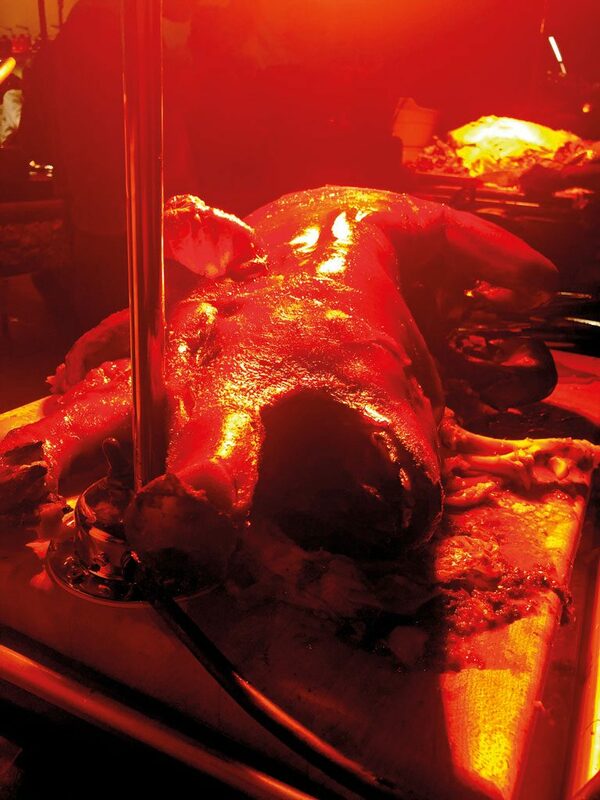 Today, amongst the items served in the special feast is the famous Balinese Babi Guling, or suckling pig. The pig’s belly is filled with cassava leafs and herbs such as ginger and lemongrass. The whole pig is roasted, leaving the skin crunchy, while the meat remains soft and succulent, flavoured with some spices and zest that are infused through the cooking process. Then there’s BebekBetutu, a duck dish that is very hot and spicy. The whole duck is boiled together with a mix of grinder spices, then wrapped in a banana leaf and steamed. This dish uses plenty of chilis, so make sure you have something refreshing to wash it down! Moving on, we all know what satay is, right? Little chunks of marinated meat threaded onto bamboo skewers, grilled over coals until charred. In Bali, the typical Balinese pork satay, normally served with rice cakes or locally known as Tipat, is famous amongst the Indonesians in general and visitors who are into hot and spicy treats. Marinated in a paste of turmeric, lemongrass, garlic, shallots, chilies, sugar, and coriander, this dish is popular amongst the Balinese especially during temple ceremonies and other cultural festivals, where pork satay stalls can be found outside the temple’s premises and on the streets. In addition to the typical Balinese, Indonesian dishes from the across the archipelago, too, are a familiar flavour and common sight in Bali. Items such as Soto Ayam, chicken with Indonesian herbs and seasoning, as well as the famous NasiGoreng and Mie Goreng, fried rice and fried noodles respectively, can be found throughout the island. Bold, strong and exotic flavours are the driving force behind the burgeoning popularity of the typical Balinese and Indonesian food in general. And if these bursting, exotic flavours are what you are looking out for in a splendid dining experience, a number of Bali’s top-notch restaurants have put traditional food on the spotlight, giving the exotic cuisine of their home island the attention it deserves. In the Bukit area, Double Ikat restaurant offers a modern take on the exoticism from across the archipelago. From starters to desserts, local flavours are served with a service that is genuinely friendly in that unique Balinese way, but also polished and highly efficient. A must try here are the “PerkedelJagung” (crispy corn and chilli fritters with onion sambal),“Babi Guling” (Bali’s famous slow roasted spiced pig), “Nasi Goreng Kambing” (spiced lamb fried rice, grilled bultara organic lamb chop), and “Udang Bakar Uluwatu” (grilled king tiger prawn with Sambal Matah and sweet soy). 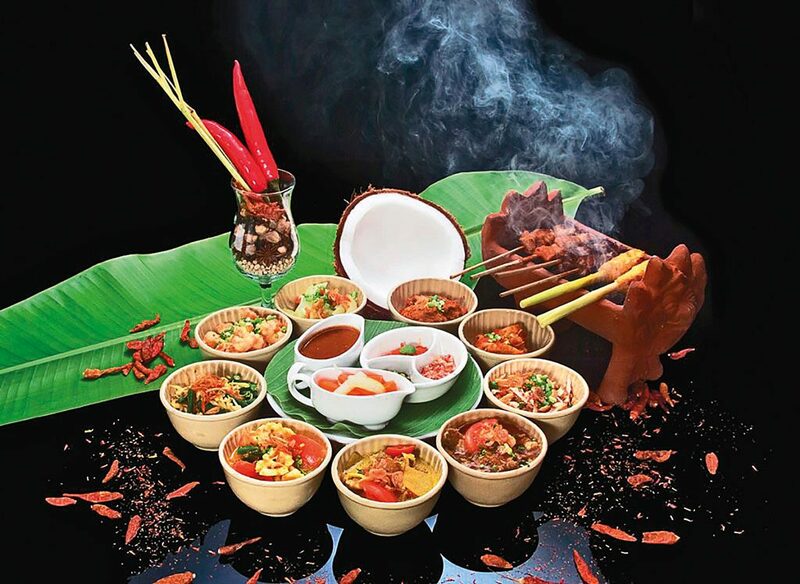 In the neighbouring Pecatu, Rayunan Restaurant at the Wyndham Dreamland Resort Bali celebrates the classic Indonesian flavours through “Nusantara Night”, held on Friday nights . Rayunan is the Balinese word for “food”, and it sets the tone for the restaurant as it showcases an expanse of local delicacies. 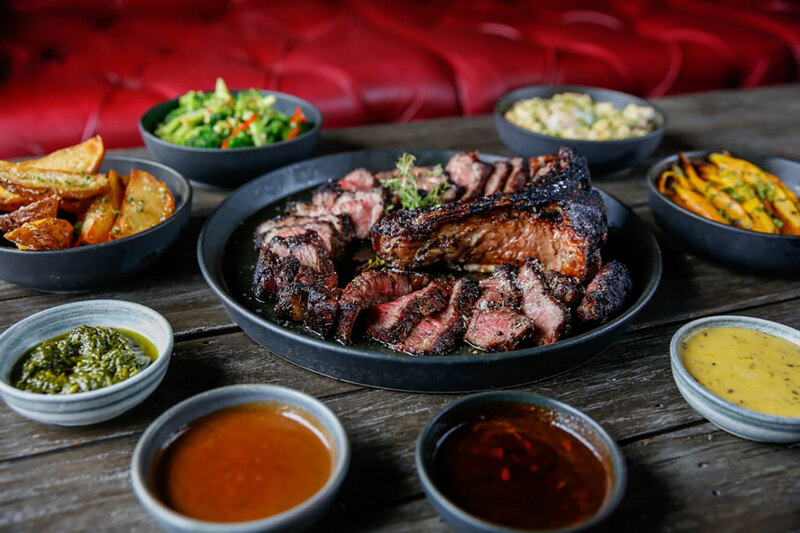 The dishes served here are all comprised of top-quality ingredients sourced locally and prepared authentically. 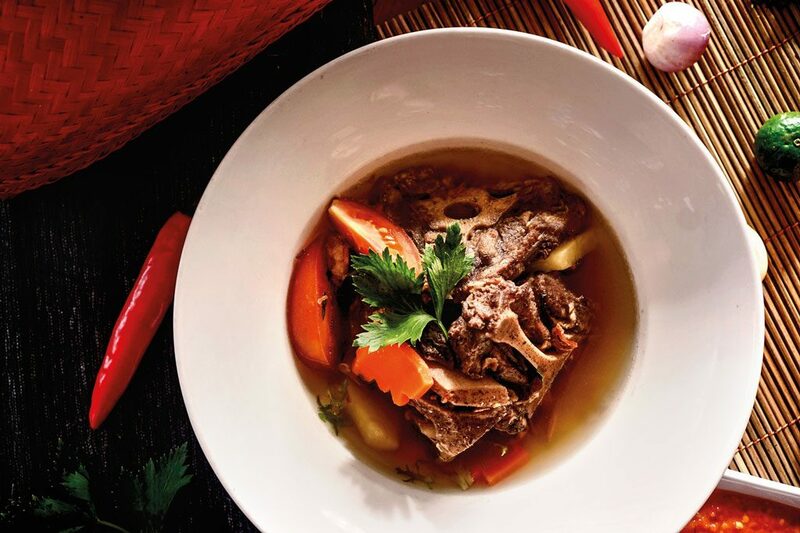 Specialties that should not be missed include the “Classic Oxtail Soup” and “Beef Rendang ala Padang”, both meticulously prepared by Chef Nyoman Wardana. An impressive array of timeless Indonesian desserts, such as “Nusantara Srikaya”, “PulungPulung”, and “Ubi Misi Juruh” are also featured on the menu to perfectly conclude your culinary journey through Indonesia. 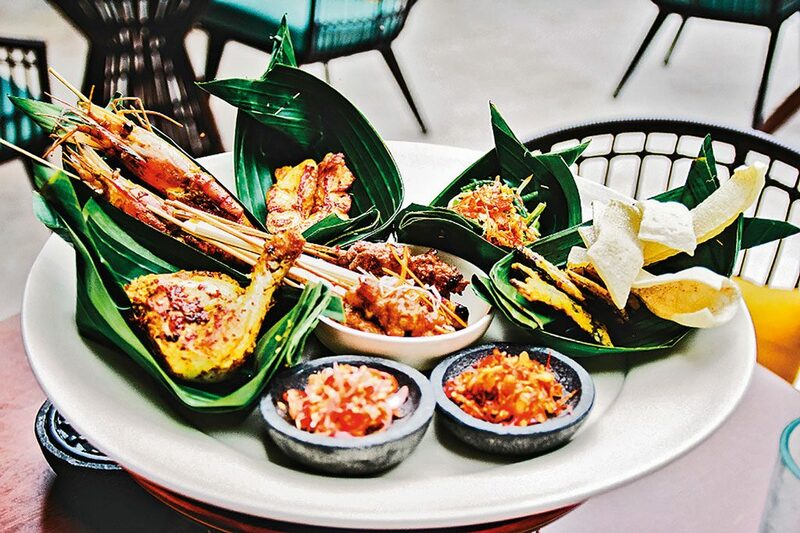 Down in Seminyak, Anantara Seminyak has extended the Indonesian selection on their MoonLite Kitchen and Bar’s menu, with “Nasi Bakar” (with pork, beef Rendang or salted fish) as the favourite of the restaurant’s patrons. The resort’s restaurant and beachside bar, Sunset on Seminyak or popularly known as S.O.S, has also introduced a pair of Sambal gurus to its award-winning dining experience. These experts will help you choose from the restaurant’s wide selection of Indonesian chilli pastes and hot sauces to enhance your food. In a role similar to a sommelier, the Sambal gurus will advise you on the perfect Sambal for your meal – from ginger-infused rica-rica for barbecued meats to fruit-focused Sambals for seafood dishes. 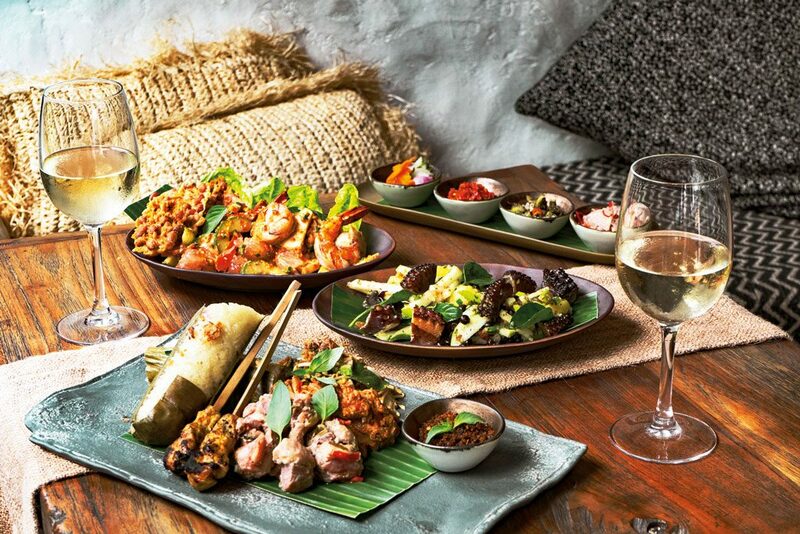 In Kuta, Kunyit makes a great introduction to the traditional delicacies of Bali and Indonesia, offering a sensory dining experience that specialises in local cuisine. Meaning turmeric in Indonesian, which is one of the key ingredients incorporated into many of the dishes served across the archipelago, the restaurant’s speciality is the Megibung. Highly recommended for those who want to experience ancient Balinese family dining, this one can give a real ‘kick’ to your tummy! This set of dishes contains chicken and pork satay, grilled prawn, pork belly, grilled chicken with Sambal Matah, steamed fish wrapped in banana leaf, Balinese sausages and Balinese vegetables (a mix of green beans and sprouts plus seasonal vegetables lightly dressed in shaved coconut and chilli). Into the poppies lane in Kuta, the legendary Poppies Restaurant in Kuta through its Rijstaffel (rice table) allows a truly magnificent feast of small tasty portions of Indonesian delights from all around the East Indies. This was the colonial Dutch way to sample the best food of Indonesia, and Poppies guests can enjoy the same experience today. For three and a half decades the restaurant has been welcoming visitors and friends from around the world to these hanging gardens of Kuta, offering them fine dining and calming respite from the ever- increasing hustle and bustle beyond its walls. Aside from the Rijstaffel, the restaurant’s current menu includes several house favorites that remain as popular today as when Poppies introduced them in 1973. In Canggu, a fine establishment and a living art gallery of prized items from ancient times, Hotel Tugu Bali is celebrated for its commitment to conserve authentic Indonesia – including food of the archipelago! 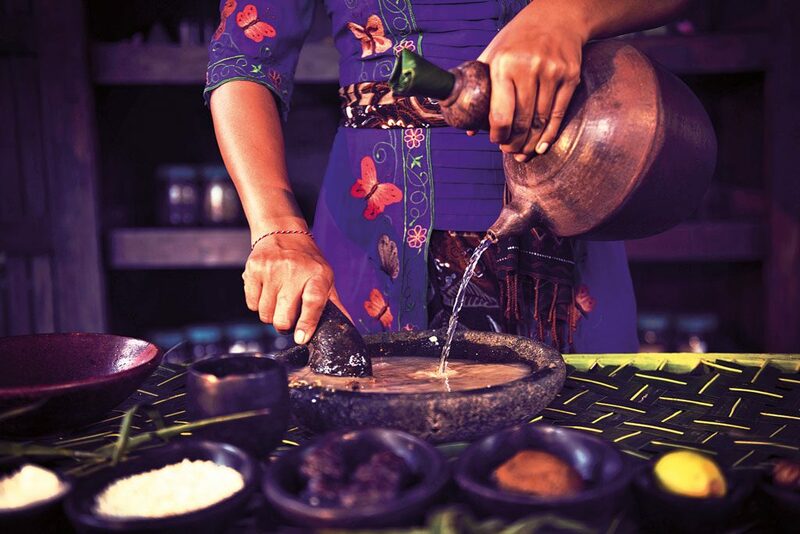 And while Tugu’s cuisine breathes authenticity, both in its traditional Balinese and Javanese offerings, the resort’s Waroeng Djamoe offers a unique experience where you have a taste of the traditional elixir known as Jamu, used for healing and rejuvenating. Jamu originated from the palaces in Java, favoured as the remedy to cure illnesses and maintain overall health. To preserve the knowledge of this traditional medicine, the tightly guarded recipes have been handed down through generations. However, in the past decades this tradition has been disappearing as western medicines took over. Now with the recent movement of organic and all-natural healing preferred over chemicals, Tugu has been initiating the comeback of the traditional, all-natural Indonesian Jamu for daily maintenance of wellbeing. Set in an authentic and mildly dramatised Javanese kitchen, having a taste of Jamu (or even make it) is a step back in time to the days where kitchens and backyards also served as pharmacies. The experience is hassle-free, fun and undoubtedly the healthiest way to relive an ancient Indonesian tradition. In Ubud, Liap Liap takes you to the far reaches of the Indonesian islands, at least in a culinary sense . In the long search for ‘something different’, it was the vibrant culinary heritage of the brave tribes from Sulawesi to Papua that caught the attention of this restaurant’s conceptors. 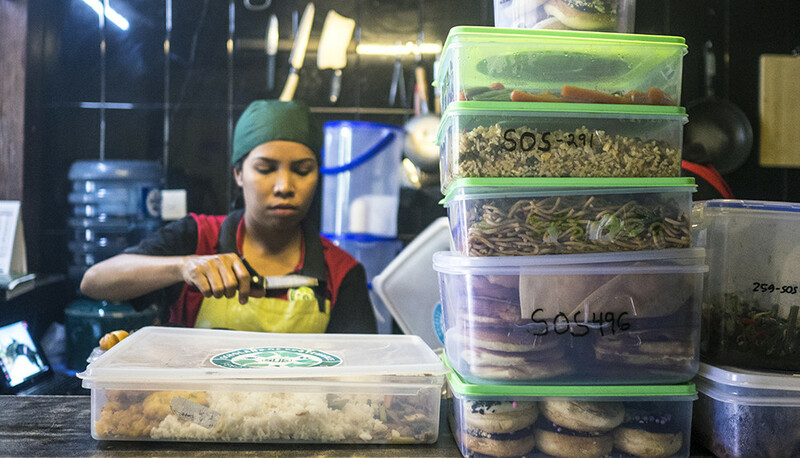 Inspired by unique, indigenous cooking techniques, it was clear that this would offer something truly novel. The LiapLiap team and their Chef de Cuisine, MandifWarokka, embrace the roots and take them further into exotic grilling and smoking techniques using bamboos and coconut shells as the stars of their menu. Many of the dishes are rich in regional herbs and spices, or offer a distinct grilled flavour worthy of a savour. Many of the dishes are rich in regional herbs and spices, or offer a distinct grilled flavour worthy of a savour. There are many flavours and styles on offer at this restaurant, with skewers, grilled sides, Indonesian salads, traditional desserts, signature dishes and a very special paella-styled Liwetricedish. Here, the food highlights refined passion and craftsmanship to create bold and alluring presentation styles, sparing no effort in bringing the finest the archipelago has to offer.